Materials delivery to the victims of Hurricane Matthew in Guantanamo advances to safe passage and with the rigor required, to ensure this process not to deviate from the provisions of the law. Denny Legrá Azahares, Chairman of the Provincial Defense Council (CPD by its Spanish acronym), and Nancy Acosta Hernandez, second in command of that body, stressed that challenge during an exchange with housing technicians and other officials linked to that important and urgent mission in Baracoa, Maisi and Imías municipalities. Acosta Hernandez demanded greater dynamism to these commissions, the same prevailing in other tasks of the recovery phase in those municipalities and also in San Antonio del Sur and Yateras, also affected by the hydro-meteorological phenomenon. 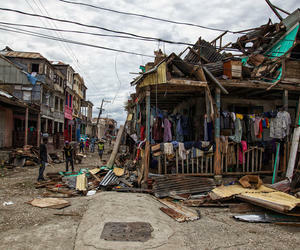 Legrá Azahares, meanwhile, stressed that the population affected by Matthew has expressed confidence that the Revolution will not let them unprotected, and to correspond to that trust it is required that people whose homes were totally destroyed to return as soon as possible to their homes, for which it is necessary to have building elements in their hands. Guantanamo people whose homes lost roofs and walls knew the decision of the Revolutionary Government to cover half the price of such materials, while CDP added another one, which greatly benefits them. Under a resolution of the Ministry of Finance and Prices, it was oriented the delivery to people affected of fifty asphalt fiber tiles, 10 yards of roundwood, five kilograms of nails of different diameter and a bag of cement, for which they will pay only 15 Cuban pesos (at about 0.60 US dollars).